Four decades after President Nixon declared “war on cancer,” the public still is not ready to declare victory, but many believe progress is being made. But that is not the case with two other public health challenges — prescription drug use and mental illness — where Americans believe the country is losing ground. To be sure, the public believes that cancer remains a major national problem—79% say it is extremely or very serious, according to the Pew Research Center’s latest national survey. But 54% of Americans say that the nation is making progress on cancer, while just 15% think it is losing ground and 31% say that things are staying about the same. (The American Cancer Society said in a 2013 report that the 5-year relative survival rate for all persons diagnosed with cancer of all types between 2002 and 2008 was 68%, up from 49% in 1975-77). When it comes to mental illness, just 19% say the nation is making progress in dealing with the disease while 16% say it is making progress on prescription drug abuse. Significantly more Americans say the country is losing ground on these two problems (35% on mental illness, 37% on prescription drug abuse). Those are the most pessimistic measures for any of the seven public health issues included in the survey. Deaths from prescription drug abuse are in the rise, according to the CDC. In an effort to deal with the problem, the FDA recently recommended stricter controls on popular and frequently prescribed painkillers, such as Vicodin. Relatively few Americans (17%) also think progress is being made in combating alcohol abuse, but a lower number (23%) say ground is being lost than in the cases of mental illness or prescription drug abuse. About six-in-ten (58%) say the alcohol abuse problem is staying about the same, while 23% say the country is losing ground on dealing with alcohol abuse. The public has a mixed assessment of the struggle against obesity – 28% say the U.S. is making progress, 34% say it is losing ground while 36% see things as largely unchanged. The obesity rate in the U.S. appears to have mostly leveled off in recent years after a sharp rise during the 1980s and 1990s. For cigarette smoking and AIDS, like cancer, the trajectory is clearly positive in the public’s view. 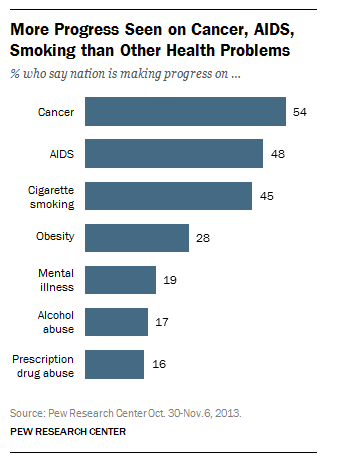 More say the nation is making progress than losing ground on both cigarette smoking (45% to 13%) and AIDS (48% to 12%).